This lesson plan was created specifically to accompany the PhET simulation "Isotopes and Atomic Mass". It provides explicit guidance for modeling atoms and their variant isotopes. As students add neutrons to the nuclear model, they can see a relationship between the stability of the atom and its abundance in nature. The model makes it easy to visualize that atoms of one element always have the same number of protons, but can have various numbers of neutrons. It will help students differentiate Atomic Number (number of protons in the nucleus) from Mass Number (the number of protons and neutrons. 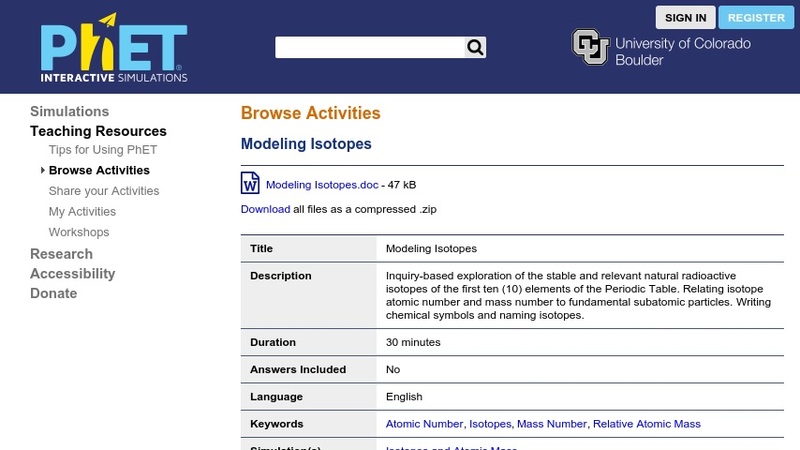 The isotope simulation, which must be open and displayed to complete this activity, is available from PhET at: Isotopes and Atomic Mass. This lesson is part of PhET (Physics Education Technology Project), a large collection of free interactive simulations for science education.